Mariano’s is a relatively new chain of supermarkets in the Chicago area that’s been getting a lot of positive buzz for its large selection of fresh produce and it’s many prepared food areas within every store. Each store also has a wonderful make-your-own salad bar. My new job is not far from a Mariano’s near Chicago’s lakefront, so I venture over there at least once a week for a salad bar lunch. Many of the pre-made salads and other items on the bar have too much salt for me, however, as does all the prepared foods on a large prepared food buffet (items like chicken, fish, mashed potatoes). I’ve asked store help and they tell me everything is slated before cooking, everything. It really makes me sad to even look at the food buffet there, not to mention other food stations, such as an in-store pizza area, that I cannot buy anything at that would conform to my diet needs. Shame on you Mariano’s for not thinking about low-salt, low-fat, low-sugar options. 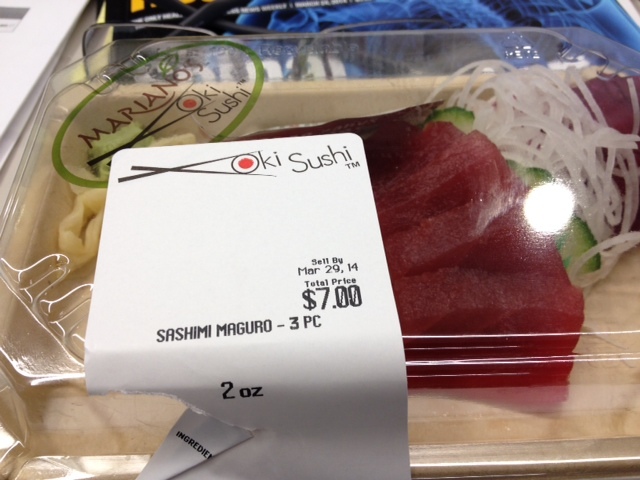 This Mariano’s sashimi was ok, but not worth the price and not all that tasty without soy sauce. Each Mariano’s also has a sushi bar and pre-packaged sushi for takeout. I formally had sushi at least once a week but now avoid it because of the salt in soy sauce that I would normally use to accompany it. Plus, I’ve been advised to avoid white rice, which many sushi selections are made with. Looking at the Mariano’s sushi selection one day, however, I saw some sashimi tuna, slices of wonderful ahi tuna, and thought they would be a nice accompaniment for my usual salad. I bought this package for $7, getting two ounces of sashimi. You can do the math, that comes out to $56 a pound, not bad for the retailer. What I found was that without soy sauce, the tuna seemed a bit flavorless to me. It wasn’t worth the price, in my opinion, so I won’t be trying it again. Sorry Mariano’s, try again to give me some better salt-free options. What’s the Skinny On Salt?